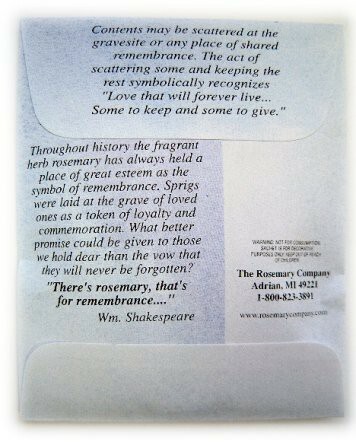 In moments of quiet reflection, the contents of these packets can be scattered in any place that brings back special memories. 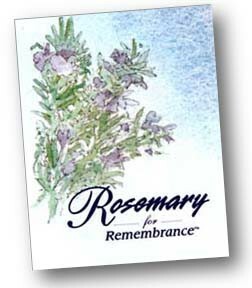 Rosemary for Remembrance memorial packets contain scented rosemary which can be taken to the cemetery, or any place of shared remembrance. 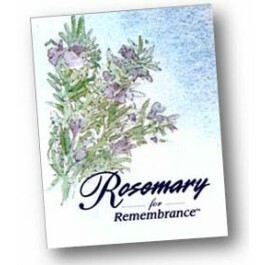 These beautiful lavender envelopes contain a resealable packet of scented rosemary botanicals with the story of rosemary printed on the back. Scattering some of the contents while keeping the rest represents "love that will forever live...some to keep and some to give" This message is repeated on the back of the memorial packet, and its lovely fragrance will be a positive reminder of someone dear. Packets measure 2-7/8" x 3-1/2" in size.